After a long, often dreary winter, your customers are ready for a fun challenge. Why not build your brand, sell merchandise and add some excitement at the same time? 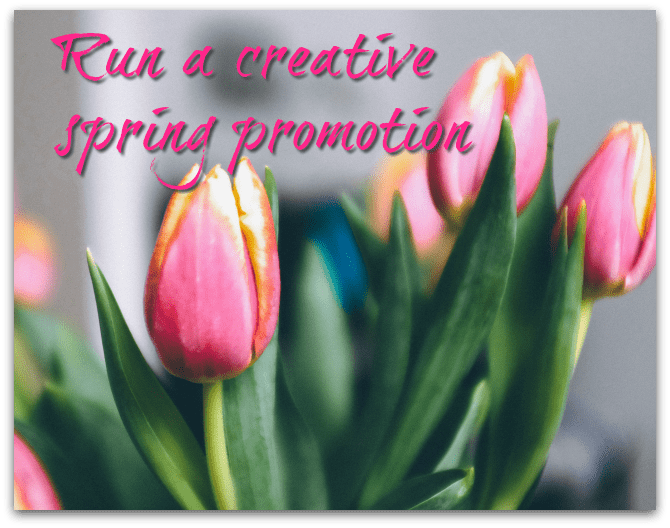 Choose one of these 6 ideas to bump up you spring consignment promotions. For greater Facebook coverage, the goal now is engagement. Run an easy fill-in-the-blank Facebook contest finishing the sentence, “The best part about spring is…” Get your customers engaged and get them talking. This is one of the easiest spring consignment promotions to run. This contest should be short and sweet. Tease with 48-hour notice. Run the contest for 48 hours total and announce the winner within 48 hours. Randomly, pick one entry and award a gift card to your store. Make sure the value of the gift card is large enough for customers to take the time to fill in the sentence. When the winner is announced, arrange to have their photo taken for use in all of your social media. Whether it’s re-decorating a living room or changing someone’s personal look, a spring makeover giveaway is one of the best consignment promotions. By spring, everyone’s ready for a change. Capitalize on the fame of Extreme Makeover or What Not to Wear. Offer several prizes so there’s lots of chances to win. For instance, if you’re a furniture store, offer your customers a $2,000 total room makeover. Involve a local designer, paint store and contractor to team up with you. A $1000 2nd prize could be for a select grouping of furniture and 3rd prize could be a $500 gift card to your store. For clothing stores, create a complete makeover for your customers that includes a $1,000 wardrobe update. Tie in with a hair & nail salon, a makeup representative and a personal stylist. A $500 2nd prize could provide a beautiful new wardrobe and your 3rd prize could be a $250 gift card. Set specific dates for entry forms and use all of your social media to generate a buzz. In Facebook, choose the “Advertise Your Business” tab and then “Promote Your Business Locally.” Your ads will specifically target your local community. Take lots and lots of photos of the winners to use in future marketing. There are so many creative opportunities at this time of year for a photo contest. When winter is over, your customers venture back outdoors (unless of course you’re already in a warm, sunny location). Choose an imaginative theme and create a hashtag specifically for this event. For instance, Easter is April 1st. Use a hashtag like #EasterMemories and invite people to submit photos of their family celebrating this special day. April 1st is also April Fool’s Day. 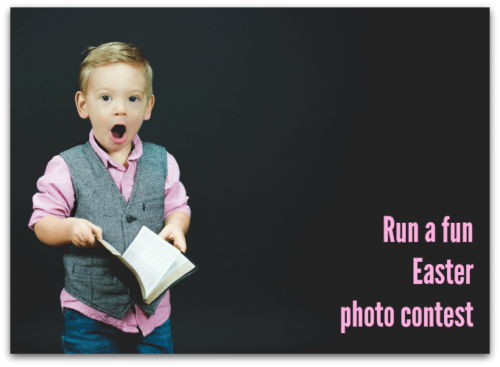 Create a photo contest around shopper’s silly shenanigans. Or, just celebrate the fact that it’s spring with an outdoor nature photo contest. Begin teasing your contest around March 16. Let people know the rules and time frame. Start accepting photos on April 2nd. Once again, your prizes have to be worthy of someone taking the time to photograph and upload their photo. For more information about Facebook contests, read Why you should use Facebook contests. As I mention in the post, I chose Heyo to help me organize my contest. For only $25 a month, Heyo helps you track and complete your contest easily. You’ll have a good idea within 4 days how well your contest is doing. So measure the length of time for your contest by the engagement you receive. Sometimes it’s more fun to offer lots of little giveaways rather than one big one. Build one of your spring consignment promotions around bundling merchandise. Run a spring sweepstakes that only requires an email address to win. Be sure to post the full contest rules too. Obviously, the perfect tie-in to this consignment promotion would be a local florist. Together, you can cross promote one another and the contest. Your store and the florist offer a small giveaway (i.e. accessories from your store and a small bouquet from the florist) then provide a discount coupon for a future purchase. Make sure the florist provides you with fresh flowers daily as part of the overall promotion. In turn, create special store signage that provides your business cards to their shoppers. Both of you will benefit. Bundle small items and randomly choose winners from the email addresses you’ve been receiving. Tuesday, March 20th is officially the first day of spring. Begin choosing daily winners on that day through Friday. On Saturday, March 24th, offer a little larger prize and a beautiful bouquet to one lucky winner. Make sure you take lots of photos of each winner to use in social media later. User-Generated Content (UGC) can boost brand recognition faster than anything else. Read Customer content is the best way to promote yourself to find out more about its’ effectiveness. This particular consignment promotion doesn’t even require a giveaway. Use a wall in your store as the perfect selfie station. 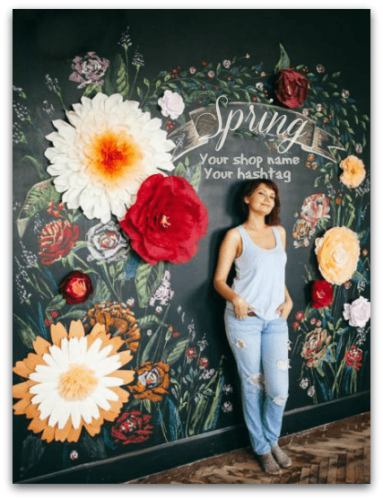 Create a special spring backdrop that includes your store’s name and the hashtag you want to promote. Have a long selfie stick available for everyone who comes into your store. In return for the person’s first name and email address, post their photo on your Facebook and email the photo to them. Encourage them to post it on their Facebook page too with your special hashtag. Spring is the perfect time for a gardening giveaway. Flowers seeds are an inexpensive way to build your email list of potential new shoppers too. Although National Friendship Day isn’t until August 5th, you can still create a special “seeds of friendship” event. Host an evening of food, beverages and shopping. If a shopper brings a friend to the event, both get a special discount or gift card to your shop. Everyone leaves with a packet of seeds. For additional impact have your store name and logo imprinted on the seed packet. We’ve used Bentley Seeds for a special giveaway at the NARTS conference. Once the seeds are sown, hopefully it will be an all-summer reminder of your special evening.